Hello there! 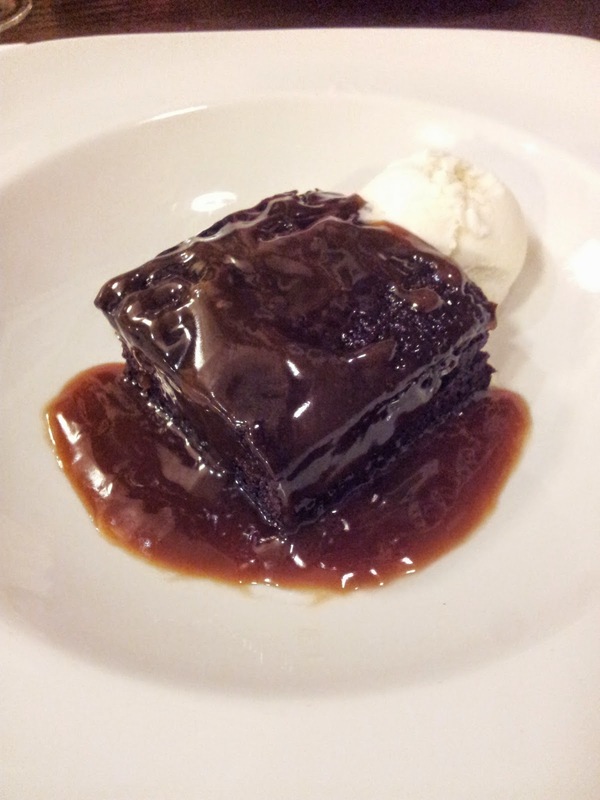 It is less than a week to Easter, so I thought it only fitting to do a (sort of) Easter themed treats blogpost! 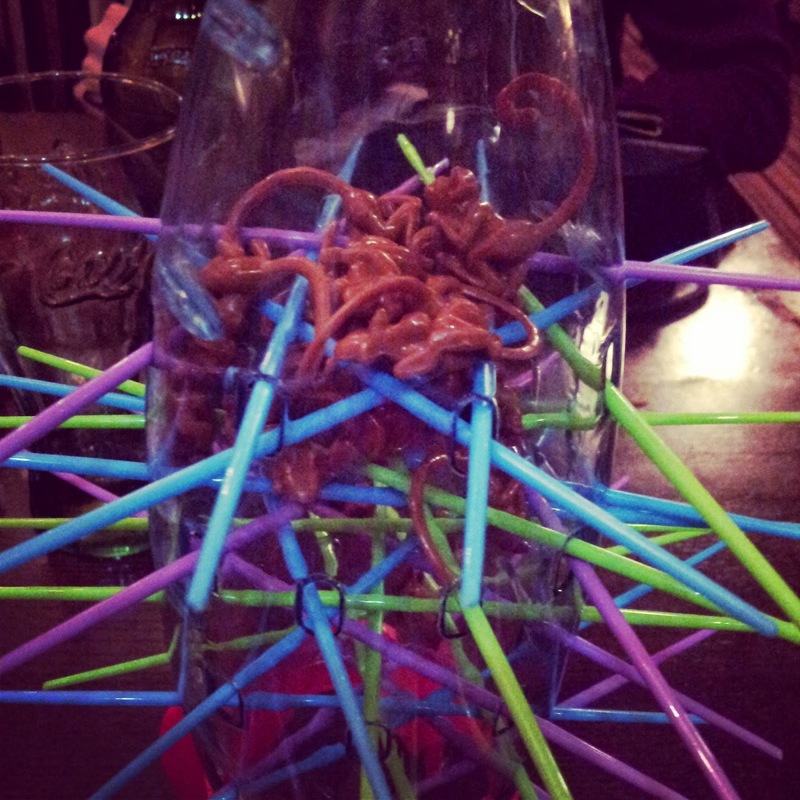 These chocolate lollipops are really easy to make, and a lot of fun as you can customise them to your own taste. Hello there! How has your week been? For once, although I've been busy, my week has been nice and calm. The weekend was bit of a chill out, which was seriously needed as I can't remember the last time I had an 'at home' day! I've done a bit of work this week, but I've given myself a bit of a break before the next 2 weeks, which I'm sure will now be filled with reading and essay work. Sunday was a really nice day weather-wise, so I took Tilly out on a long walk around the village which I think actually managed to wear her out! On Monday Tom and I went out for a curry with our friend Lewis. 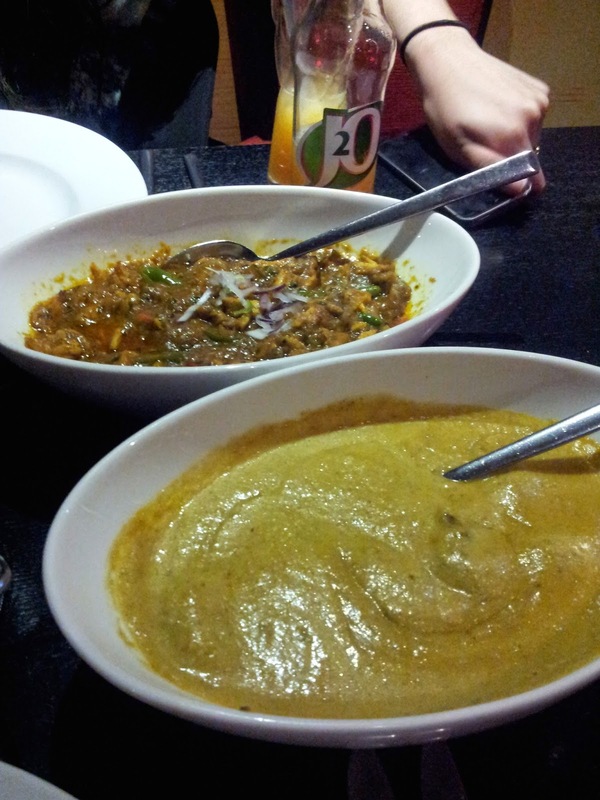 We went to the Spice of Balti in Bungay (which neither Tom nor I had been to before) and it was really lovely! As it was a Monday evening, they weren't that busy which meant the food came really quickly. I think I can safely say Tom and I will be returning again! It was really nice to catch up over a meal with a friend that we hadn't seen since Christmas and to see what he has been up to. The rest of the week was quite chilled, and on Thursday Tom and I went on the train to Ipswich to go and stay with his dad. I counted, and this was the 7th train that I had gotten this month! Again, I hadn't seen him and his partner since Christmas, so this was a really nice way to catch up. 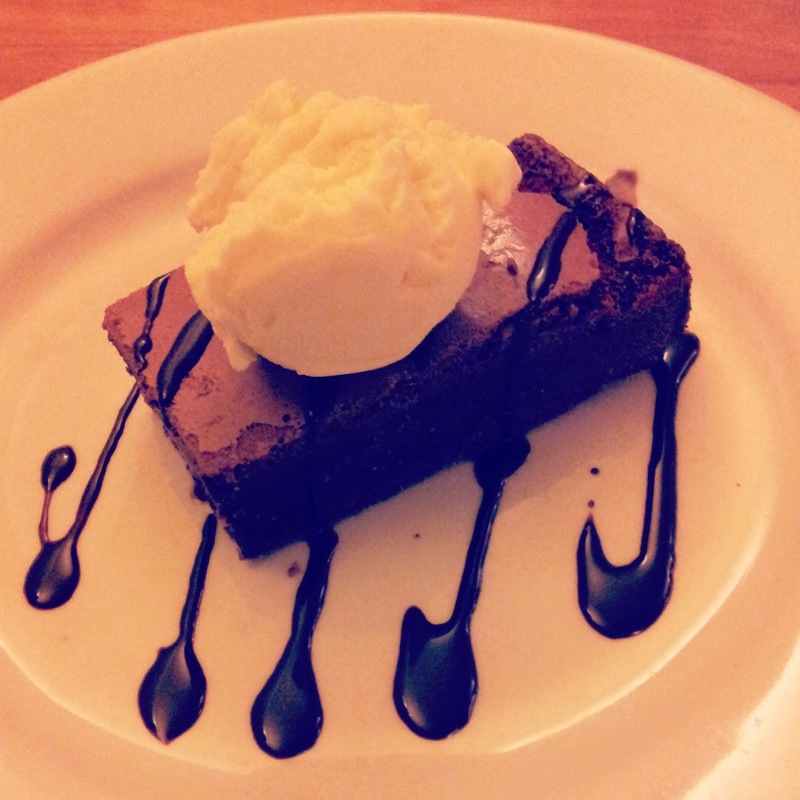 We went to 'The Shannon' pub for tea, where I had a Chicken and Mushroom Pie, followed by an amazing brownie! The evening then proceeded with Tom and I playing the 'Million Pound Drop' board game- it's actually really hard! 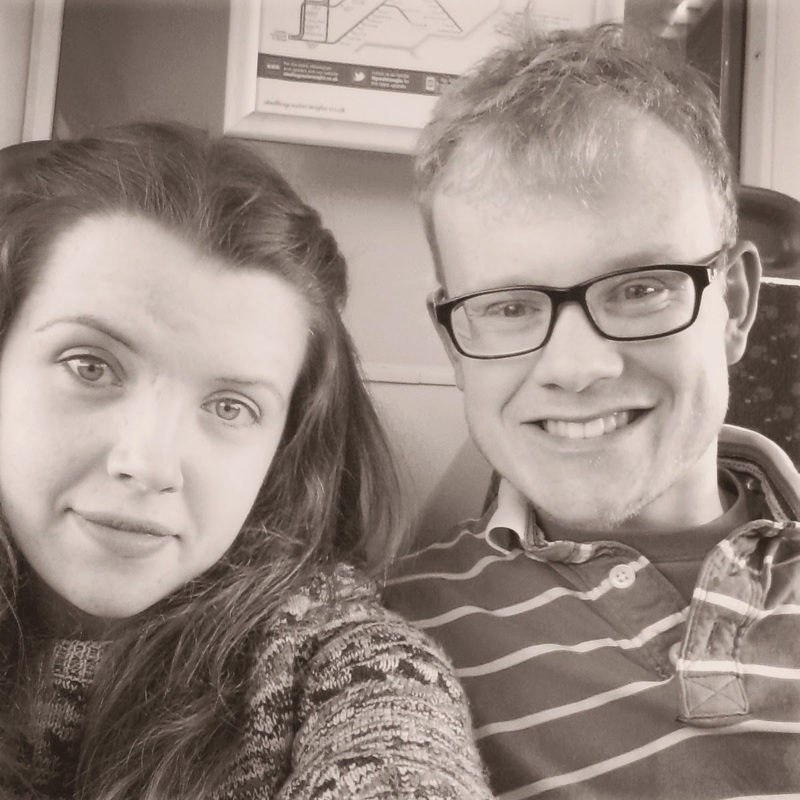 Today I had to say goodbye to Tom for 2 weeks, as he's back off to Sheffield tomorrow. I know this may not seem like a long time to be apart, but I've been so used to living with him now, that I'm going to miss him lots! My dad took this photo- it was a moment where Tilly was sitting like a person on her back legs! Hello there! It's time again to have a round up of my monthly favourites! I can't believe that we are almost into the 4th month of the year- where is the year going?! This month has been super busy, and I've been up to a lot, so I have a few things to share with you that I have been loving! You will have seen these if you read my latest #52weeksofhappiness post, as I bought these from a shop called the 'Culture Vulture' in the Corn Exchange in Leeds. I found these and fell in love with them. Every time someone came to our house, I made them go to my room to have a look at them! I think they are just so cute, yet unique as I haven't seen anything in a similar design before. They are now dotted about my room, and make a lovely addition to my love of cats that I seem to have at the moment! My music love of the month has been Shania Twain. I don't know if it's because I went to Pop Tarts recently or what, but I've been listening to her album 'Come on Over' a lot this month. I know that my parents liked her, and used to play this album when I was younger, so it's quite nostalgic listening back to it! My favourite tracks are 'I'm Holdin' On To Love (To Save My Life)', 'Come On Over', 'Don't Be Stupid (You Know I Love You)', 'Man! I Feel Like A Woman' and of course, 'That Don't Impress Me Much'. This month has been absolutely manic, and so my calendar and diary have been able to keep me on top of all my commitments! I think once I am back at Uni, I'll need to schedule in some 'me time' as my busyness did start to get a bit too much. I do like to be busy, but it got to the point where I was just too busy and started to frazzle out a bit. That being said, my calendar and diary ensured that I did manage to keep up with everything, to which I am very grateful. I have been on a lot of trains this month! And it would have been a lot more expensive had it not been for my student railcard that gets you a 1/3 off fare. I managed to pay £2.95 to get back from Leeds to Sheffield, and even the ticket man commented on how good that was. Without my card, I would have to pay a lot more, especially for the train when I come home, so if you use the train a lot, I would definitely recommend looking into any discount cards that you could use! 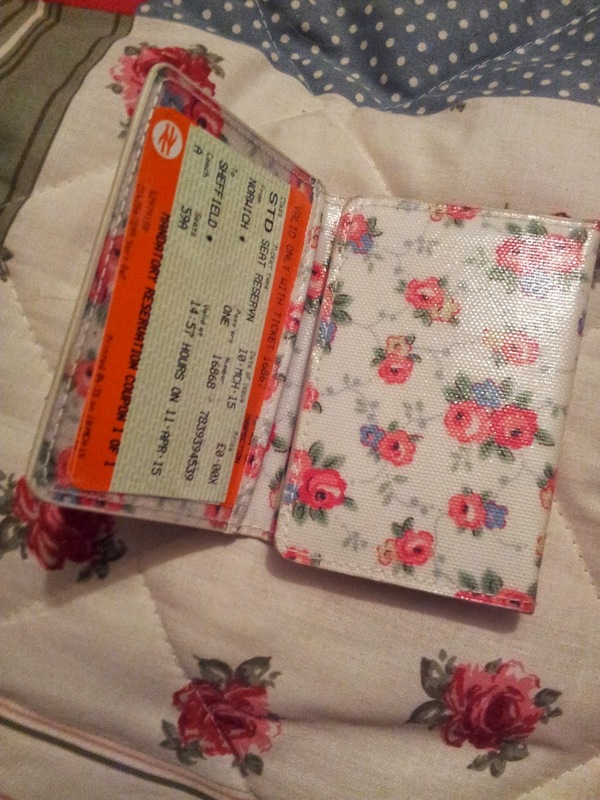 I use this ticket holder from Cath Kidston that always holds my student rail card, and my train tickets so I don't lose them on a journey. 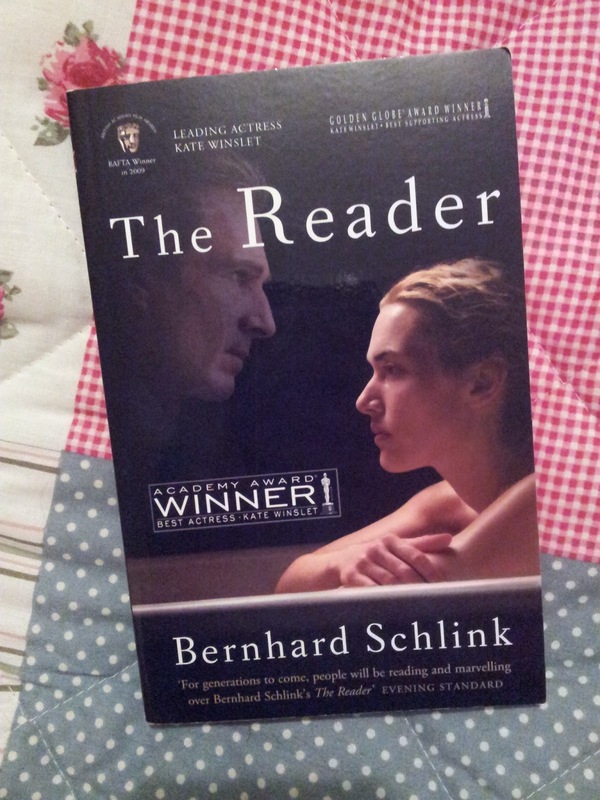 My book recommendation of the month has to be The Reader by Bernhard Schlink. One of my current modules is entitled 'Representing the Holocaust', and this was one of the texts that I will be studying after Easter. I decided to read it early, as I want to use it for my essay, and it was such an interesting read. I now want to watch the film and see how that compares to the book. So if you're on the lookout for an interesting read, I would definitely go for The Reader! It provides light on an aspect of the holocaust that isn't always thought about in detail within literature, but I won't spoil what that is, so just go and read it! So there are my favourites from the month! Is there anything that you have been loving throughout March? Hello there! We are now back to the usual posting of this on a Saturday again. This week, of course, has been busy. 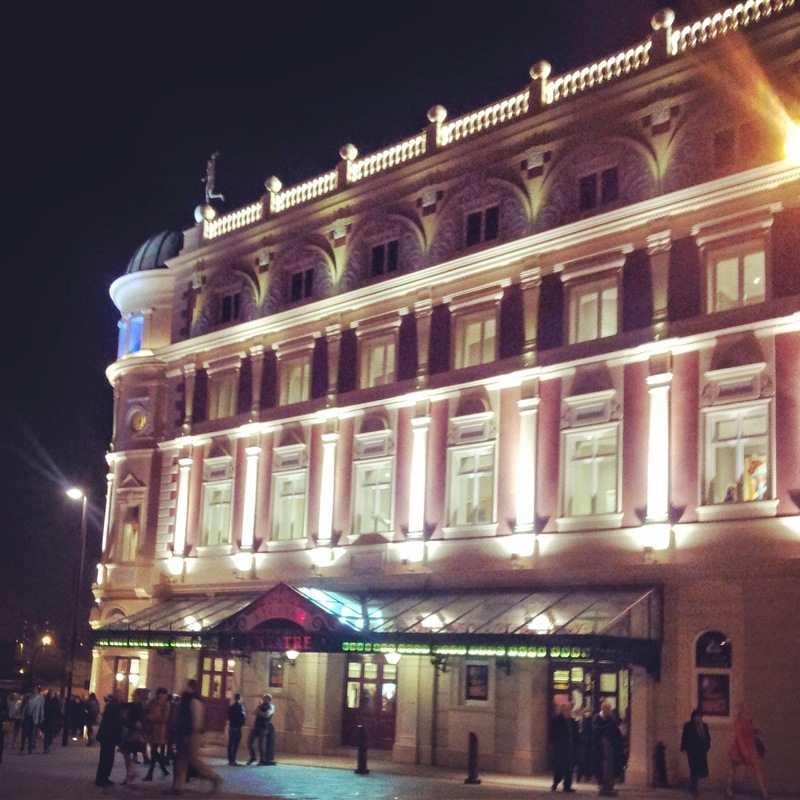 I went away with my mum to Leeds for the weekend, and we had a lovely time. Neither of us had ever been to Leeds before, and so we wanted to experience a new city, plus it meant that we were together on Mother's Day! One thing I will say about Leeds, is that there are so many shopping centres/arcades! We would come out of one, and another one would appear from across the road. Leeds was a really nice city, and isn't too far away from Sheffield so I'm sure I'll be returning again. One of the highlights of my week was going to the Lyceum theatre in the city, and watching a performance of the Wuthering Heights ballet. I was really interested in seeing how they would perform such a dark story, as the other ballet's I have been to are more of your classics (Sleeping Beauty and Cinderella). The story was shown really well, and I can't wait to go back to the theatre again! Every time I go, I always think 'I really should go more', and so Tom and I have booked to go and see Jesus Christ Superstar in April which I'm really excited about! 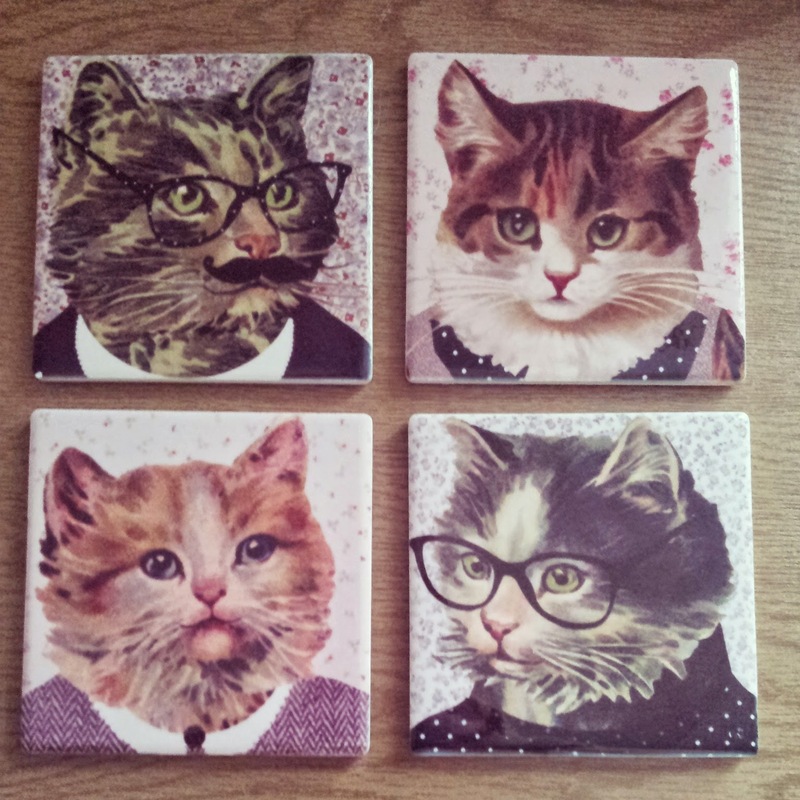 A purchase I made at the Corn Exchange- how cute are they? 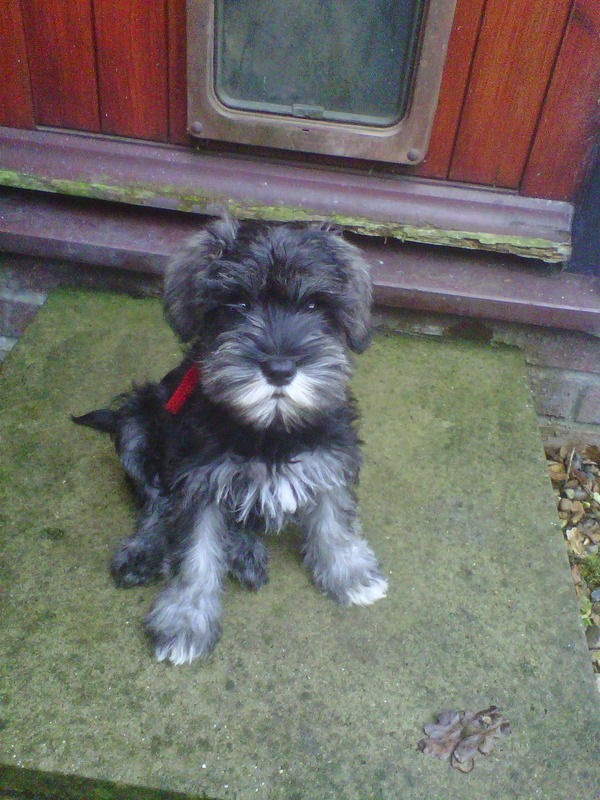 I have now come home for the Easter holidays, so expect to see a lot of pictures of Tilly again! Hello there! I know you've all been anxiously anticipating part two of the A-Z of me, so here it is! If you missed A-M, you can catch up here before you read the rest of the letters. So here we go! Okay so I slightly cheated on this letter, (I'm sorry that I'm having to twist so many of them!). I know a lot of people love Pixar for Toy Story, or Monsters Inc., but my favourite Pixar film by far is Finding Nemo! I still remember going to see this in the cinema, and I just love Dory. I know that there's a 'Finding Dory' film coming out in the near future, but I think I'll wait to see the trailer before I decide to go and watch it, as I don't want it to ruin the original! Another one of my all-time favourite tv series is that of One Tree Hill. I think I only started watching it from about series 4-5, but I made sure to buy the box set once all 9 series were complete! If you've never watched it, seriously, go and watch it. But, unlike me, make sure you watch it from the beginning! This way you'll really get into the characters (not that I didn't, but they'd make references to things I didn't know about). As I'm writing this I'm making a mental note to myself to bring the box set back after Easter so I can watch it again! This might come as a surprise to some people, as I don't think I've mentioned it on my blog before, but I love to paint. When I was younger for every birthday my Grandad used to paint me a picture, and he is where I get my talent and love of it from. My favourite mediums to work with are acrylic and watercolour. The thing that I really like to draw/paint is wildlife (if you ask me to draw a person, I will draw a stickman) and I'm hoping that if I can become less busy next term (one can hope) I'll be able to get right back into it again. I always, always wanted a quilt when I was younger. But I knew that I'd never be able to make one myself as I am terrible at sewing. At home there's still a half-completed embroidery image of a fisherman with a fish, which I started when I was about 5, and still haven't completed as I just get bored/annoyed as I can't do it properly. However for Christmas last year, my parents bought me one that I could finally put on my bed! I am someone who easily gets cold, and so this comes in handy when I'm going to bed (plus it just looks so cute). From a young age, I have always had pet rabbits. We also used to have guinea pigs too! Currently I now have two rabbits; a girl called Sprinkle and a boy named Hazel (I picked the name Sprinkle when I was about 12, and when we bought Hazel, we were told that he was a girl, but after finding out he was a boy I just decided to keep the same name). Unlike how my hamsters used to be, both of the rabbits love a cuddle (especially Sprinkle). 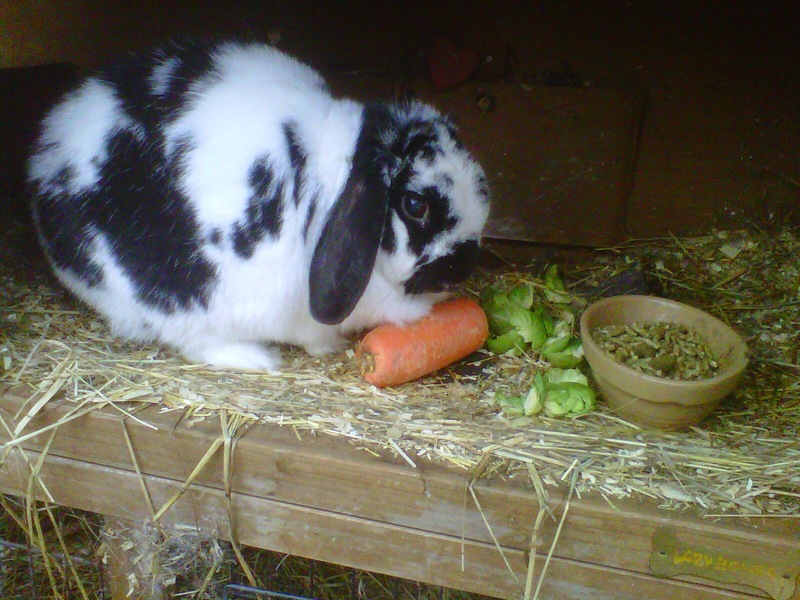 This is Sprinkle, I couldn't find a photo of Hazel that wasn't blurry as he moves too quickly! I am a massive lover of the sea. I find it so calming. I never used to like piers as you could see the sea between the slats of wood, but that was just a fear of it falling down. But on a cheerier note, I do like to just stand on the shore and watch it roll in and out! I am much more of a sea swimmer on holiday rather than a pool swimmer, and I absolutely love to swim in the Mediterranean as it's so warm and you can go snorkelling and see all of the fish. That was the one thing that I missed when Tom and I went on holiday to Lanzarote, as the island is situated in the Atlantic sea and so was freezing cold! Cromer/Overstrand in North Norfolk. It's not the med, but it's still lovely. T of course had to go to Thomas. But there has to be two. Of course there's Thomas who I go on about all the time, who is just so lovely and wonderful and I am just ever so lucky to have in my life. (I'll stop being soppy now). The other Thomas that I love is the writer Thomas Hardy. I talked about his novel Tess of the D'urbervilles in my '10 books that left an impression on me' which if you missed, you can read here. Although his novels and poetry are anything but happy, he writes in such a beautiful way that makes me thoroughly enjoy reading his work, and makes him one of my favourite authors. Throw back to Tom and I in 2010. Wasn't he such a cutie?? If you didn't know, I am currently studying English Literature at The University of Sheffield. Can I just say, this was one of the best decisions that I have ever made. I didn't actually decide that I wanted to come to University until the end of year 12, as I was adamant that I didn't want to go. However Tom went to a fair where he picked up a lot of prospectuses, which of course I had a look through and haven't looked back since. 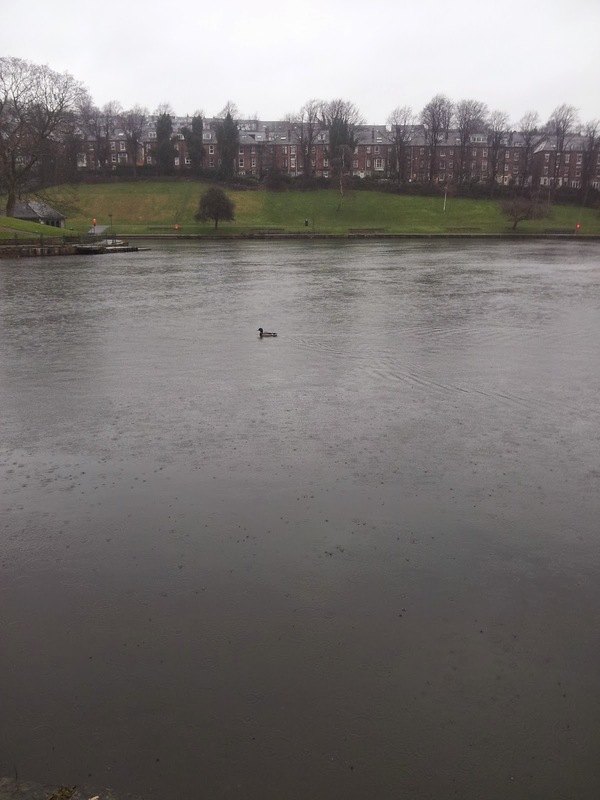 I did two blogposts about my University experience, which if you missed you can see here and here. I've met so many amazing people, and have had so many opportunities that I wouldn't have had otherwise, that if you're currently in the process of thinking about whether to go to University or not, I definitely wouldn't completely dismiss it but suggest you look into it further! A lot of people don't know this about me, but I used to be a vegetarian. I was one for about two years, but even now although I do eat meat, I don't eat a lot of it. Particularly while I am at University I eat a lot of Quorn, as it tends to be cheaper and keeps for a lot longer than meat does. I find it easier to cook with, as you're not worrying about whether it's cooked all the way through or not, as at the end of the day if it isn't, it's only made out of mushrooms! I am a mahoosive Disney fan. When I was younger, while my parents had their tea, I would always sit and watch a disney movie. Goodness knows how many hours of my life have been spent watching disney movies. Now I have a few favourites. My favourite princess movie is Sleeping Beauty, and I also love Robin Hood. To this day I can still not watch The Lion King/Dumbo/Bambi because of the parent deaths/separations (plot spoilers sorry) as they still make me cry. I absolutely love the soundtracks to the movies, and they're great to revise/do work too! For my 6th birthday, I went to Disneyland for the first time and was just blown away. I have been back 2 times after this, one of which was with Tom in 2012. We queued for absolutely ages to meet Winnie the Pooh as he kept going for toilet breaks. What was magical was going on Thunder Mountain at about 10:30 pm, whilst the parade was on, as when you came out into the open aired areas, you could see the whole park lit up. I really want to go back again, but it's just so expensive! 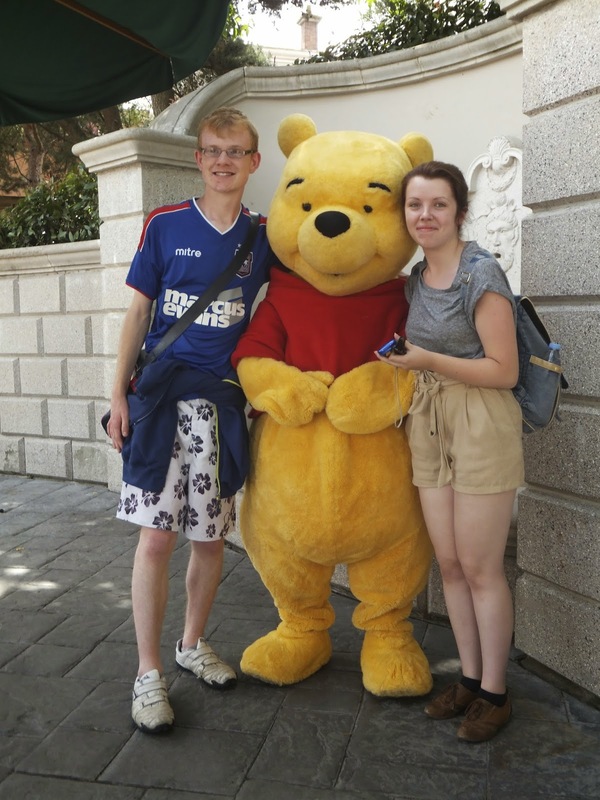 When we FINALLY met Winnie the Pooh, it was very exciting! Okay allow me another cheat. I actually had to look in the dictionary under 'x', and in my edition there are only 5 words! I don't call it Xmas, I do actually call it Christmas and it is one of my favourite times of the year. I always think the lead up is just so exciting, and everyone's in such good spirits (plus it's the only time of year I can really get away with watching Christmas films/listening to Christmas tunes). I think that even if you don't celebrate Christmas, it's still a lovely time of year to share with family and relax after a super busy year! I think it was about 3 years ago now that I started watching Youtube videos. I think the first one was when I was trying to find out what people thought the best eyeliner was to use, and after that I was hooked! The Youtube culture has definitely grown a lot from the time when I starting watching it, but there's such a range from things like make-up tutorials, to baking videos, to how to do origami- there really is something for everyone! Ah, Z, another tricky one! I thought 'Zoology' could cover my love for animals. I find them so fascinating, and if an animal is hurt in a movie, I always care a lot more than if it's a human. One of things that is on my 'bucket list' is to go to Africa and go on safari. I would absolutely love to go one day, and encounter such beautiful and fascinating creatures in their own habitat. Until that day, I'll just live out my dream through watching David Attenborough documentaries! So comes the end of the A-Z of me! I hope you've enjoyed finding out some new things about me- why not have a go at making your own? I'd love to hear the A-Z of you! Hello there! How are you? First of all I must apologise for the lack of a blogpost on Tuesday. 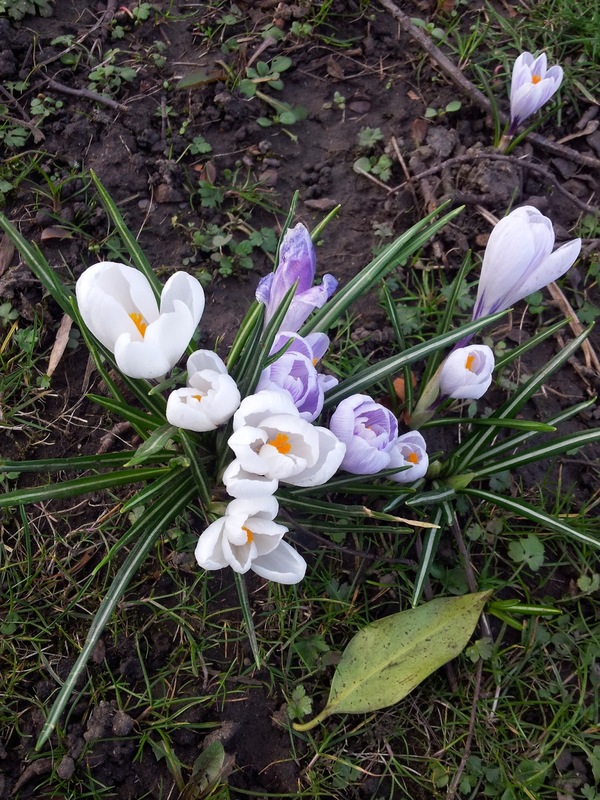 I've had this blog for about 10 months now, and I think this is the first time I have ever missed a post, without the reason being that I've gone on holiday or something. This week just got overly busy, and I didn't want to send out a half-hearted and rushed second part to my A-Z posts, so decided I'd leave it until next week. (I know you can't wait to see the other letters). Now, onto what's happened this week! Kirstie came up from London last Saturday and stayed over to the Sunday. 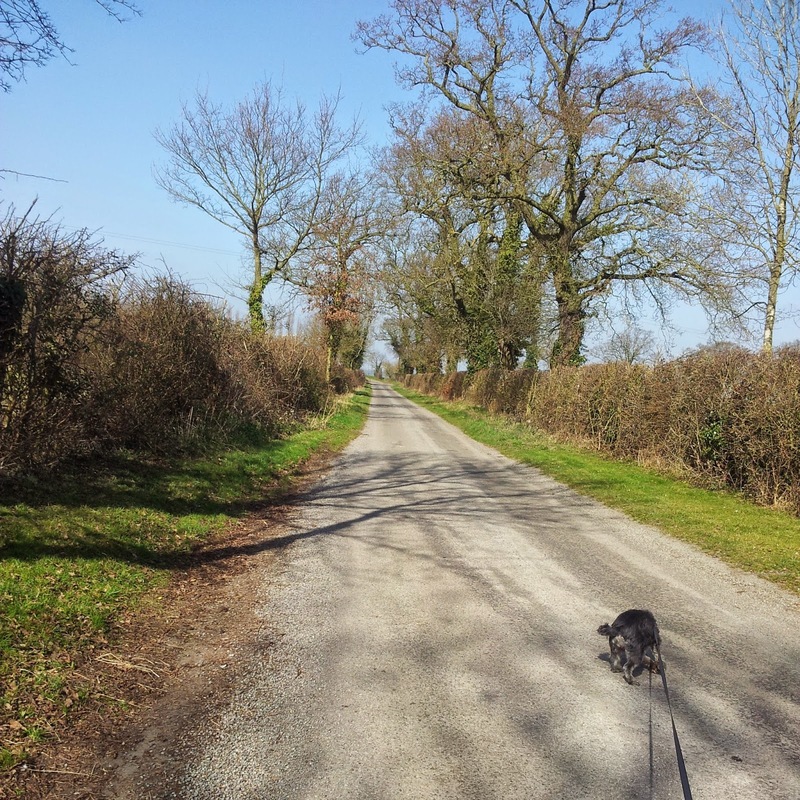 Saturday was actually such a bright, sunny and warm day! I did warn her that this isn't how it normally is, as proved Sunday when it started to rain again. 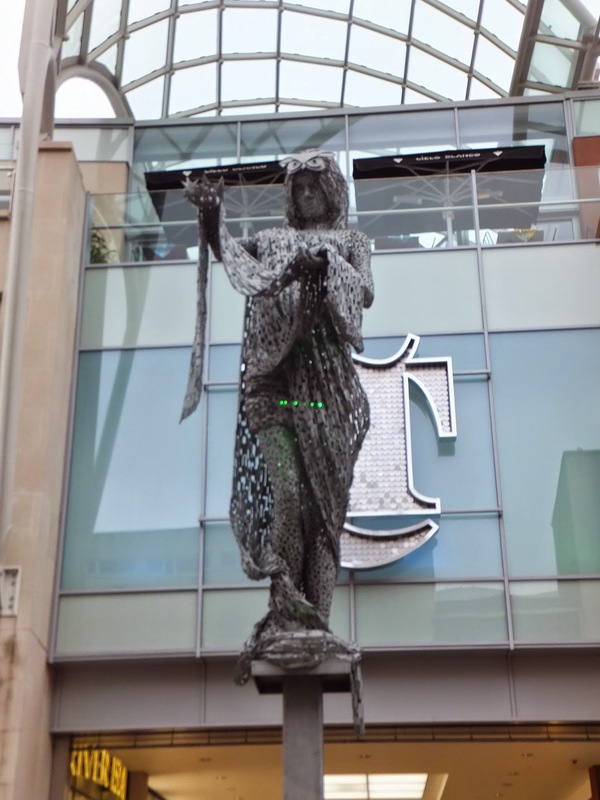 I took Kirstie to Meadowhall in the afternoon on Saturday, and by the time we had finished walking round looking at the shops we were thoroughly worn out. 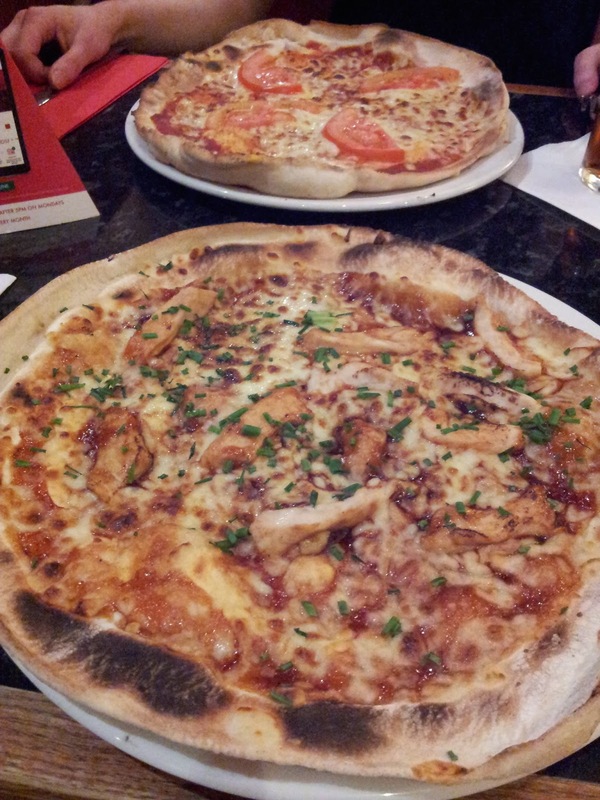 We went to Frankie and Benny's for tea (of which Tom was jealous) where Kirstie went for a Margherita pizza, and I went for a BBQ chicken one. We ventured to the pub for a drink when we came back with Tom and Luke, before returning home and watching a film. On the Sunday we walked into town and went for lunch at Patisserie Valerie before I took her to the station to catch her train. I had such a lovely weekend showing Kirstie round Sheffield as she had never been before! On Monday we all got our exam results back and hooray I passed! Tom and I just went out for a couple of drinks to celebrate at the Ball (which if you have been paying close attention to my past posts, I have mentioned before). I might as well re-name this blog as 'where Jess has been to have drinks and food this week', as on Tuesday I took Reesha out to Zara's Indian restaurant as a birthday treat. Her birthday is tomorrow, but as I'm away for the weekend I wouldn't be able to celebrate with her on the day, and so to make up for it we went out for a meal together. The waiter was so nice, and when he heard that it was Reesha's birthday this week, he brought out a cake with a candle on at the end! The rest of the week was busily filled with uni and meetings, which led me to being extremely worn out when it reached the evening yesterday! 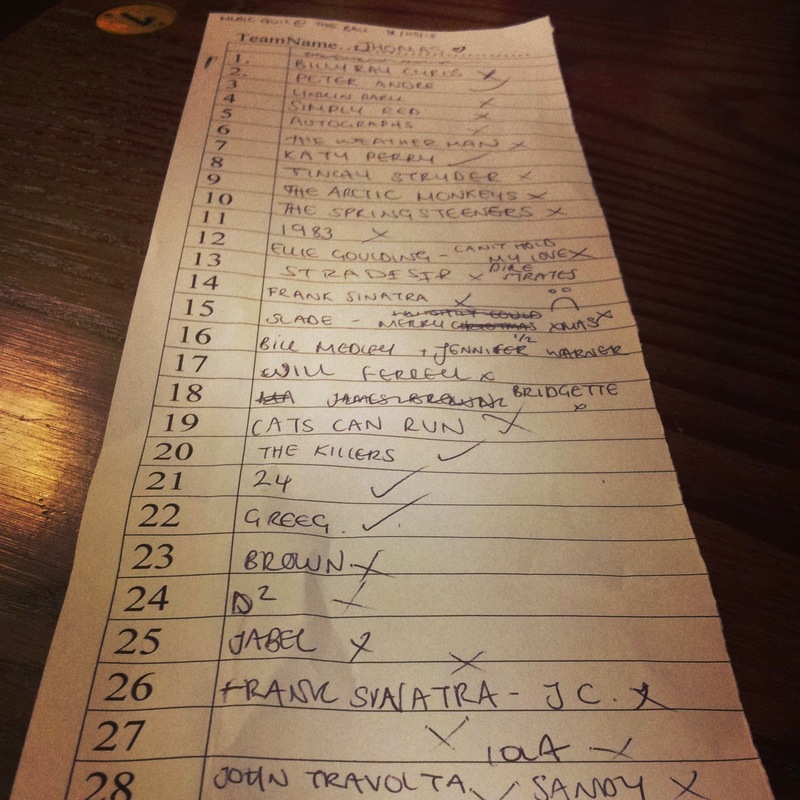 Tom and I went out to the Ball (again) for a couple of drinks to relax, and while we were there they announced they had a music quiz on, so of course we took part! Now, had it been about music from 2000 onwards, we would probably have got a better score, but as the majority seemed to be 70's or 80's (I tried to remember bands my mum/dad used to talk about and like) we scored a resounding 5 1/2 out of 30! It got to the point where we did start making up answers, but it was a laugh and I think we should go again soon. In the background they were playing all the Pop Tarts classics such as Shania Twain and Abba, so it made for a good night. At least someone enjoyed the heavy rain! 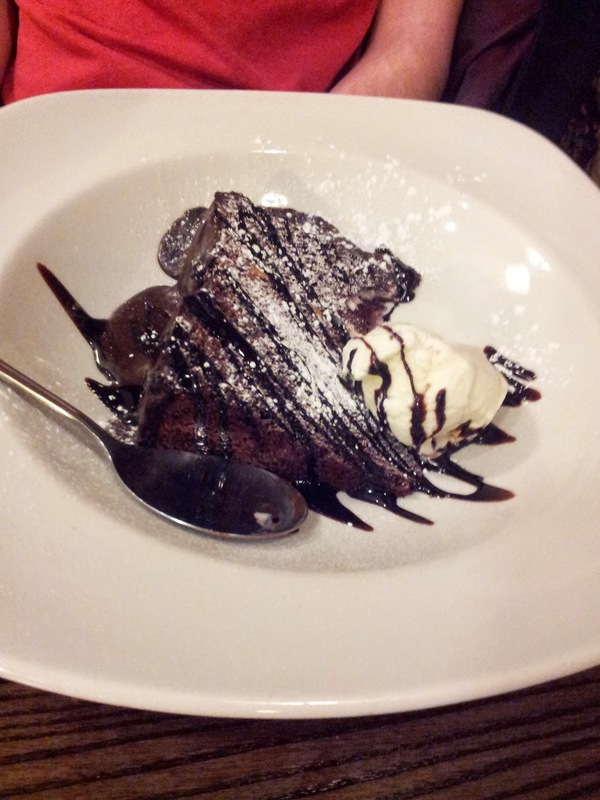 Tom went for chocolate fudge cake (of course!). Hello there! Now I know what you're thinking: hang on, it's not a Saturday, so why is there a #52weeksofhappiness post?? The answer to that is Kirstie is coming up from her uni to visit me, and I wanted to be able to spend time with her! Next week's #52weeksofhappiness post will also be appearing on the Friday as I'm away for the weekend! I know you're all thinking whether I made it Norwich with all the traffic to catch my train, and ironically there was no traffic at all! When I arrived at the train station, after saying goodbye to my parents, I went for a coffee in the cafe. Whilst I was sitting in the cafe, the train arrived in from Ipswich and all the fans were singing! On my train back I managed to finish the book that I had been reading 'Time's Arrow' by Martin Amis. It's about someone who dies, and then his soul (?) lives the life backward with him. It was a really interesting read, and I enjoyed the different structure that it took, as for what was the past for the reader, was actually the character's future. Monday saw a return to lectures and seminars, but in-between these I met up with Will for a coffee (in Interval- where else?) 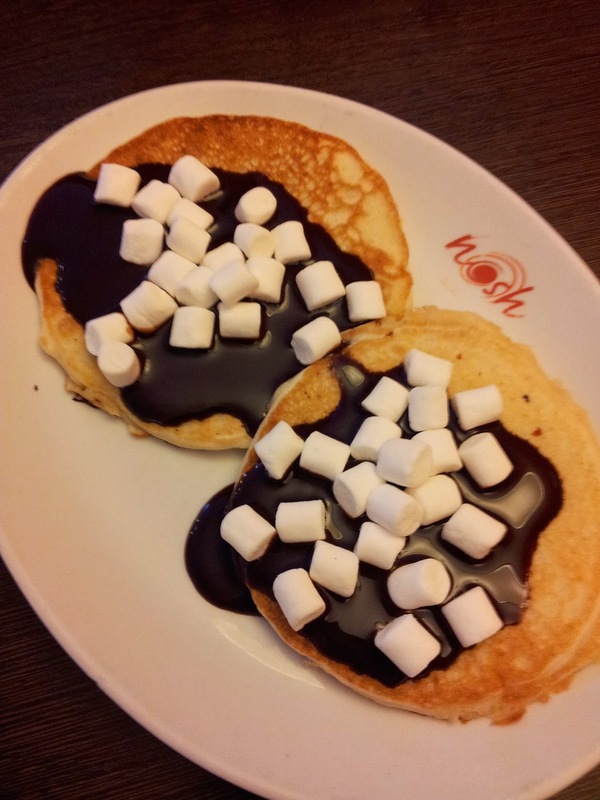 and after our lecture Megan and I went to Nosh where I had pancakes! (I will definitely be going back- especially on my birthday as you get free pancakes). I made another return to Interval for a meet up with some of my flatmates from last year and on Wednesday I went for lunch with Rachel where I had a chicken fillet burger with a sweet chilli sauce and fries. I bet you're thinking that must be all the coffee/food meet ups I had right? No. 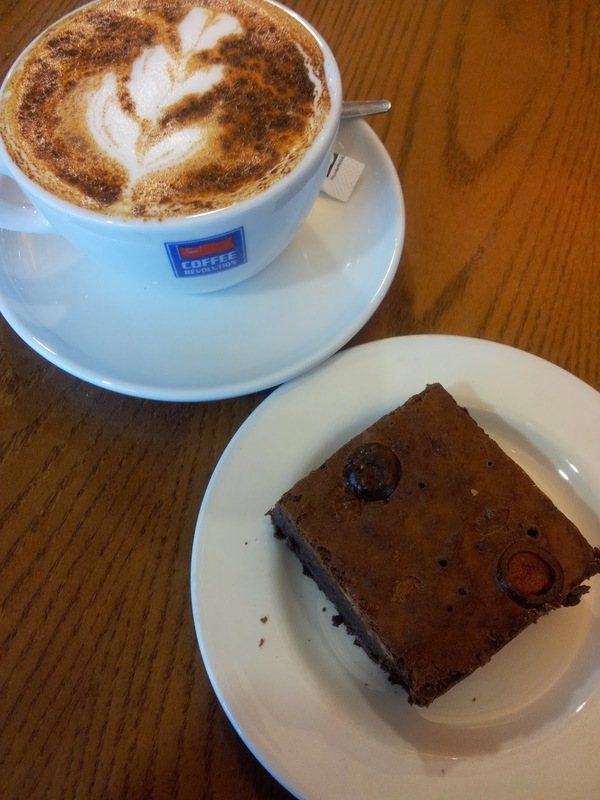 I went for a coffee with Reesha on Thursday where I had a Chai tea latte, with a malteser brownie that was to die for. Now in my defence, they all meet up for a group coffee regularly, but it's at a time when I have a lecture in a different module, so I have to make sure I still see everyone too! One thing that did not make me happy this week, was that as I walking down to the Union for a meeting, I fell over! I had been carrying a cup of tea (which I had luckily drank) in a thermal take away cup that I got from Disneyland a few years, but luckily this didn't break. I did manage to tear a hole in my jeans, so I just need to do it on the other leg and I'll be fashionable with my ripped jeans! 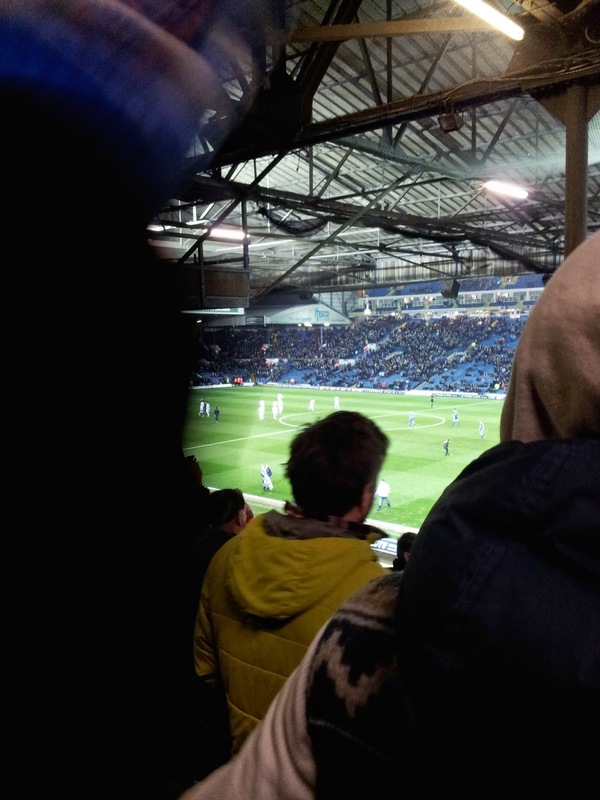 I Jess, went to a football match this week. That's right. You heard (or read?) correctly. 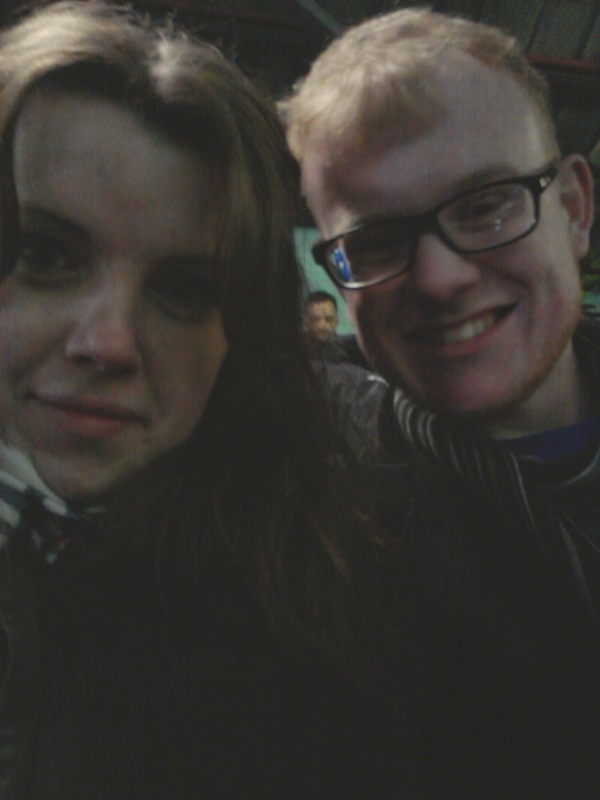 I went with Tom to Leeds, to see them play Ipswich (Tom's a massive Ipswich fan). I have been to a couple of games before, but never to a proper league one. The Leeds fans were a bit terrifying, but I think if you go to any game as a part of the away side, the home side are going to seem a bit scary! Unfortunately Ipswich lost, but it was an experience to hear all the singing. I didn't sing, but I tried to clap when they did. It was alright apart from I WAS SO COLD by the end of it. I sent my friend a text saying 'I've forgotten what it's like to be warm' and I really had! Luckily I am now all warmed up, and today it was actually a nice day that didn't need a big thick winter coat! I hope this is a sign of things to come. I can't wait for it to be spring! Hello there! This post is going to be in two parts, as it is going to be an 'A-Z of Me' and I thought it might ramble on for too long if all 26 letters are within one post! 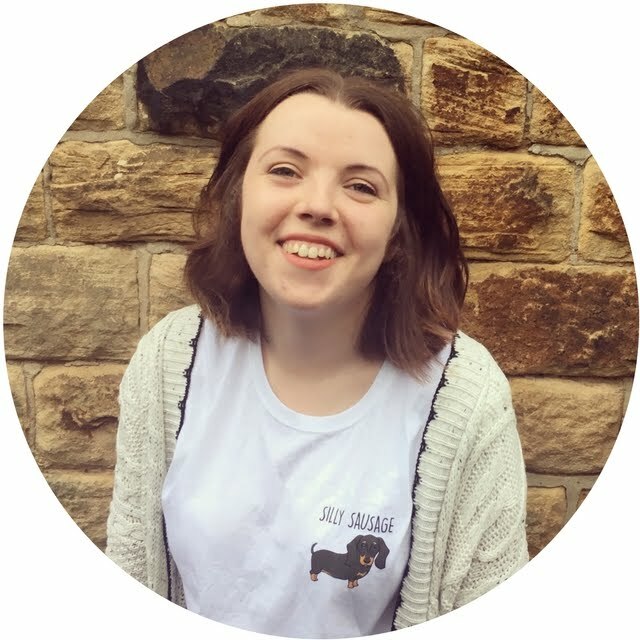 I have had this blog for a while now, and I thought it would be nice if you got to know me a bit better! A for me is Autumn. Autumn is my favourite season of them all; don't get me wrong, there are good aspects to the others, but for me Autumn is the best. I did do a post a few months ago about some of the reasons why it is my favourite, which you can read here. I love wearing jumpers, and feeling all cosy when I go outside. I study English Literature, so obviously I love books. I was brought up to love books, which allows me to thoroughly enjoy my degree! 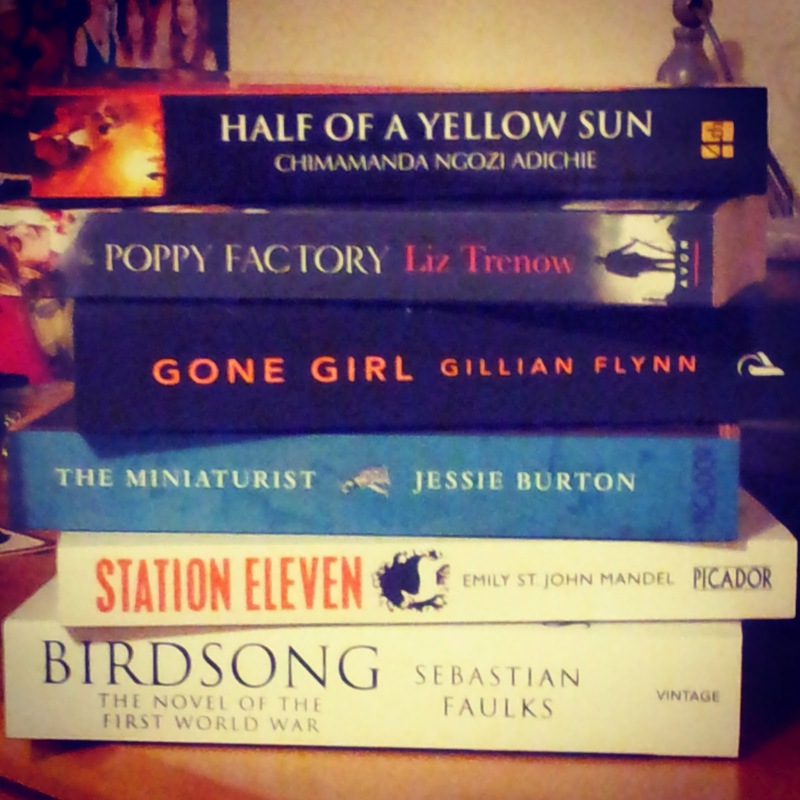 I did a post about the 10 books that left an impression on me, which you can read here! There are so many books that I love, and I really hope that one day I can have a library in my house *hint to Tom*. Now I do have a kindle (some people seemed to shun for me doing so) but for things like the classics it's so good as they're all free! It's also great when you need to travel, as you don't need to carry a massive book with you. I still love to have a book in my hand, but don't knock it 'till you've tried it! I bought these the other day to try and read something that wasn't on my course-3 paperbacks for £10 on Amazon! For C, it had to be Chatsworth. This is my all time favourite country house to visit, and no matter how many times I go, I just fall in love with it more and more. The gardens are beautiful, and I love going at different times of the year to see the progression of both the exterior and the interior of the house. If you can, go at Christmas as they decorate it with a different theme every year! I am a massive dog lover and I always have been. Before I was born, my parents had a Yorkshire Terrier called Zoe, and there's a home video of me crawling after her waving an aero wrapper! Apparently she didn't like me (and if the aero incident is anything to go by I can see why) but she was protective of me. What I class as our first family dog, was a Cavalier King Charles Spaniel called Cassie, and I think I was in Reception when we got her. We then got another Cavalier 5 years later, (Mitzi) who is still with us today! Before we got Cassie, I always loved spending time with my Nanna and Grandad's Cairn Terrier Bonnie- there's a photo of us both standing on the couch and looking out of the window together! As I got older and went to school, I always used to wave goodbye to my Mum and Dad as they went off to work, and she used to climb up to the window with me too. Of course now I have Tilly! I got her for my 18th birthday, and I have my Mum's Aunt and Uncle to thank for, as when my parents were deciding what to get me, they said 'is there anything that she has always really wanted'. As soon as I could talk, every Christmas and birthday I always asked for a puppy. 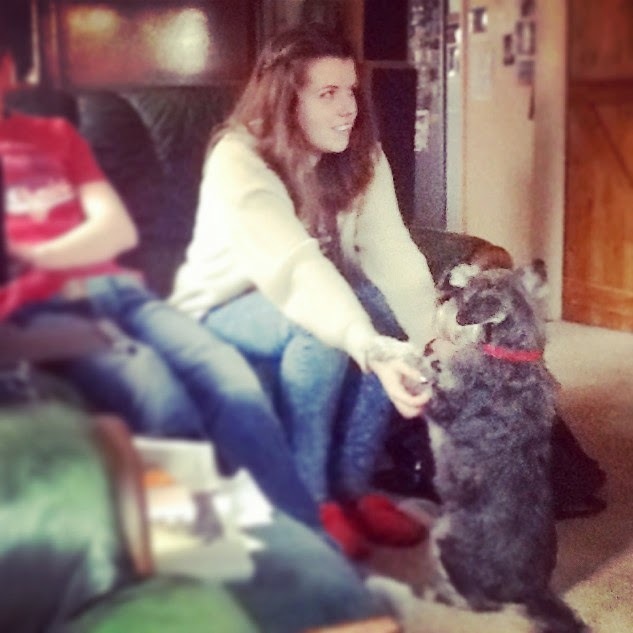 I'm looking forward to after uni where Tom and I can move into a different place, and have Tilly with us! This is Tilly a few days after we got her. HOW CUTE WAS SHE?? I'm not going to lie, I struggled with this letter. Whenever you think of the letter E, all you ever seem to be able to think of is Elephants. So, with this in mind, I decided to use this as my word and share a story with you! Not that I can actually remember it as I think I was about 2 at the time, but I went to Colchester Zoo with my Mum, Aunt and Cousin, and was apparently astounded when I saw the elephants. I think it was probably because I'd never seen anything that large! What I do remember thought is that a few years later, I went with my Nanna and Grandad and I got to feed them! I think they're such a clever and interesting animal, and I'd really like to see them in their natural habitat one day. I of course love my actual friends, but this is dedicated to the programme. I don't know how many times I've watched it now, but I love it. After watching it every night on E4 for who knows how long, they then took it off their channel. I know it moved over to Comedy Central, but as we don't have SKY TV I am unable to watch it on there! I bought myself the box set last year, and loved going through it again! One of the posters on my wall is entitled 'Everything I Know in Life I Learned from Friends' and if you're a fan like myself you'll enjoy reading through the list! I have found this blogpost where someone has listed them all, so make sure to have a read through. Now you might not know this about me, but I love playing games. I do like board games, but from a young age I have also loved the electronic sort. My Nanna had a CDI machine, and I loved playing the Alice and Wonderland game with her (although part of it was tricky, as if you got stuck you had to start the game all over again and this was after getting about 70% of the way through!). My favourite games will always be the Spyro series on the original Playstation. We still have it to this day, and I never get sick of playing them. We also had a gamecube/game boy advance, and we still have a Wii and I have a 2DS. (I did have a DS lite, but I wanted to play the new games!). I love playing Animal Crossing, and all of the Nintendo games, and Tom and I love playing Mario Kart together. (He used to be terrible at it, but then got the game himself and somehow became amazing). When I was younger I had two Syrian hamsters, and two dwarf ones (not all at the same time). Those people who are able to take out their hamster and have it play with them are very lucky people, as all mine ever wanted to do was bite me. My first Syrian hamster was called Polo, and one day managed to escape and chewed a hole in my curtain! I woke up in the middle of the night, and it was on the floor next to me so I had to go and get my mum to capture it. I knew it was getting old when it actually let me pick it up and didn't try and bite me! I love ice cream. My favourites are: Ben & Jerry's (Phish food), cola floats (cola with a dollop of vanilla ice cream on top) mango sorbet (although I think I might be allergic as it can make me cough) and I always loved getting the Tom and Jerry ice lollies! (I think these were basically just a strawberry flavoured ice lolly, in the shape of Tom and Jerry). Weirdly this goes with my last letter: ice cream. I love jelly. My all time favourite jelly is the pineapple flavoured one, but this is hard to come by. I actually found some at the weekend, in the 'Roys of Wroxham' shop in Beccles, and I had been looking for some for aaaaages. I always look in the supermarket, but nowhere seems to really stock it. Otherwise, I just go for the strawberry one. I like it plain, but I also like to put in some tinned fruit while it's still in it's liquid form! Okay so I've cheated a bit on this one, but you'll let me off won't you? I love cats. I think they're hilarious. Hours can be spent simply searching 'cat videos' on youtube. My favourite is 'Thug Life' cat which you can watch here. I don't know that I'd ever want to own a cat, as I know they can be really picky and aren't always one for cuddles (plus my mum is really allergic!) but I love seeing them out and saying hello/visiting people that have them. Okay so this was another letter I struggled with! In the end I went with 'lights' but I of course mean fairy lights! I love having fairy lights hanging up as they make a room seem just that extra bit cosy. Last year we weren't allowed to have them up in Halls, but this year I have them both on my desk and above my bed! I love putting them on in the evening, and looking outside and seeing the dark/cold but being all snug inside! I am a big fan of music. I'm one of those people who needs music to do work too-I can't sit in silence! I like a wide variety of music, and I have mentioned a few that I have been loving lately in my last few monthly favourites posts. I'm going to see the Foo Fighters in May with Megan and Tom and I am so excited! They were the one band that I always said that I would like to see live, and I thought I'd take the chance now as I didn't know when/if it would come around again! So there is the A-M of me! Make sure to come back next week for the rest of the letters! Why not have a go at making an A-Z of yourself? It's harder than you think it might be!